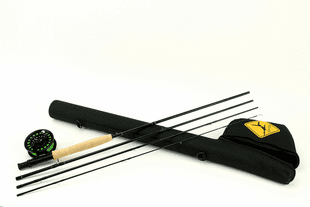 Fly Rod combo outfits include a rod with reel and line - ready to fish while saving money. 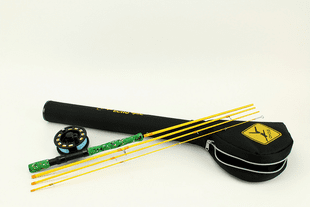 We can create a custom fly rod + reel + line combo at a competitive price at your request. Call or email the shop - let us know what you have in mind, and allow us to build your dream combo outfit. We carry complete Spey fly fishing outfits for trout, salmon, steelhead, bonefish, sea run cutthroat, and other species too. We inventory ready to fish rod packages and fishing gear for kids. 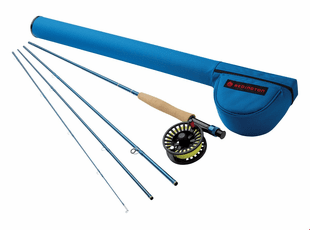 We carry complete fly fishing outfits with fly rods for Bass fly fishing, Pike, Musky, Brown trout, Atlantic salmon, silver salmon, chum salmon, pink salmon, sockeye salmon, rainbow trout, brook trout, lake trout, sea run cutthroat trout, small stream trout, lake trout, rainbow trout, golden trout, brook trout, bonefish, tarpon, permit, smallmouth bass, bucketmouth bass, striped bass, bluegill, carp, blue water tuna, lingcod, shark, coho salmon, chum salmon, chinook salmon, and sardines. We offer outfits to suit the beginner and most advanced fly angler. Are you interested in giving fly fishing an honest try? Are you a fly fishing guy or gal ready to make the transition to the Spey fishing leaders? If so, we have the combo fly fishing outfit for you. Are you responsible for buying that retirement gift for a dearly departing co-worker? Again, the Caddis Fly has the fly fishing gear to suit your needs. Are you trying to find a gift for the impossible-to-shop-for son, daughter, husband, wife, or grandchild? Guess what, The Caddis Fly has a wide variety of experience in suiting our customers with the right combo package for your fishing destinations. 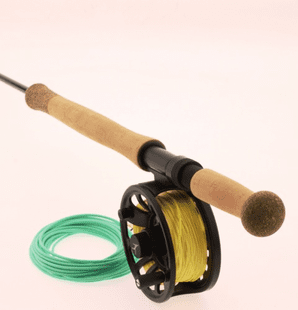 We are here to help you select an appropriate fly fishing combo outfit, complete with perfectly matched components in each fly fishing outfit including a fly rod, reel, and fly line, at the very least. We match reel, fly line, and backing to create the perfect combo. Our complete fly fishing combo outfits include manufacturers like Redington, Sage. 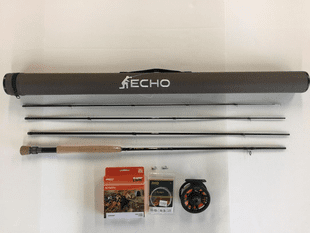 Ross, Echo Dec Hogan Spey rods, Echo Tim Rajeff Spey rods, Echo Carbon, Echo Ion, Echo Switch rods, and Echo SR fly rods. Trying to select a fly fishing outfit can indeed be a complicated process. Are you fly fishing for bass, rout, salmon, steelhead, bonefish, tarpon or permit -- and where exactly sill you be fly fishing? We inventory only high quality products, regardless of the price of various brands of fly rods and fly reels. 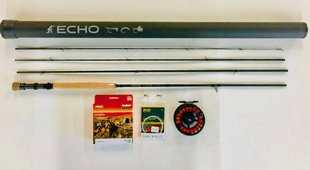 It is often only necessary for a prospective customer to indicate the general value level and we can assemble a properly matched complete fly fishing combo outfit for the occasional angler as well as the perfectionist. 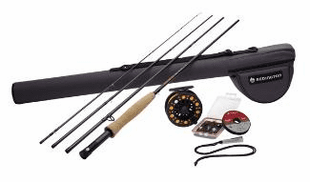 If you do not see the fly fishing outfit or several complete fly fishing rod/reel combo outfits that meet your needs, give us a call and talk with our Pro staff. We can make a recommendation for a complete fly fishing outfit to meet your individual preferences for brands, prices, target species, and so on.